The #1 Easy, Commonsense Guide to Database Design! Michael J. Hernandez’s best-selling Database Design for Mere Mortals® has earned worldwide respect as the clearest, simplest way to learn relational database design. Now, he’s made this hands-on, software-independent tutorial even easier, while ensuring that his design methodology is still relevant to the latest databases, applications, and best practices. 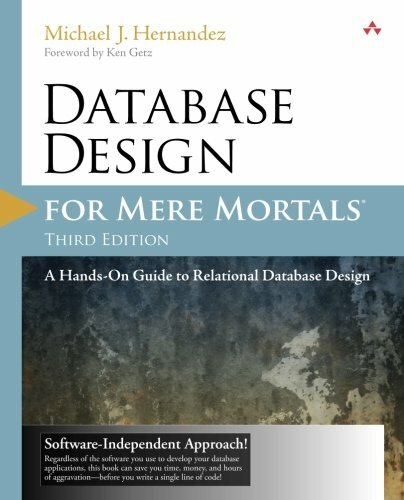 Step by step, Database Design for Mere Mortals ® , Third Edition, shows you how to design databases that are soundly structured, reliable, and flexible, even in modern web applications. Hernandez guides you through everything from database planning to defining tables, fields, keys, table relationships, business rules, and views. You’ll learn practical ways to improve data integrity, how to avoid common mistakes, and when to break the rules.